An annual celebration, Robbie Burns Day is a tribute to the life, works, and spirit of the great Scottish poet Robert Burns (1759 to 1796). Celebrated every year on his birthday, January 25th, it encompasses more or less of formal gatherings involving the indulgence in a traditional Scottish meal, the drinking of Scotch whisky, and a recitation of the works made famous by Burns himself. This year in Toronto, Tommy's Egg Kitchen made its Canadian debut putting together a public event called the Scotch Egg Club where acclaimed Scottish chef James Forrest hosted a scotch egg competition. The culinary competition featured six renowned chefs from across Canada who competed for the title of the best scotch egg. Guests than had the chance to eat and judge, tasting each of the finalists' scotch eggs to determine the ultimate winner. Not only was there an abundance of gourmet scotch eggs that night, but each egg was paired with a Dewar cocktail for the ultimate combination of Scottish fare. 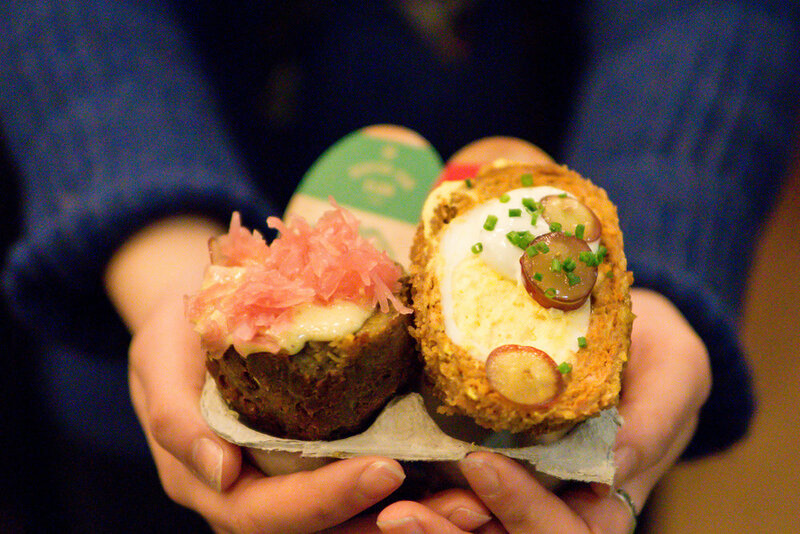 The Scotch Egg Club takes place in cities around the world and is designed to celebrate two of Tommy Dewar's great passions: whisky and chickens. Not only did Tommy Dewar produce some of the finest whisky, him and his sons raised a collection of pedigree chickens which also laid some of the best eggs. This was the origin of the relationship between scotch eggs and whisky and the Scotch Egg Club was born! Held at the Tommy's Egg Kitchen on King Street West, we were spoiled by an infinite array of the finest Scotch and Dewar's whisky cocktails, and of course six different versions of a scotch egg. After all the eggs were eaten and the votes were tallied, the winner came out to be Chef Adam Donnelley of Segovia Tapas Bar in Winnipeg! His winning chicken and foie gras Scotch egg recipe won the crowd over and will be the reigning champion of the Scotch Egg Club in Toronto. Looking forward to see what next year brings!